Broomrape | Infonet Biovision Home. Root parasitic weeds are a serious problem in many agricultural production systems. Unlike "normal" weeds that merely compete with the crop plants for nutrition and harbour diseases, root parasitic weeds damage the crops by attaching their own roots to the roots of the crop plant and taking their nutrition and water from it. They are especially hard to control because they cannot be treated as a separate plant and also they inflict much damage before emerging above ground. 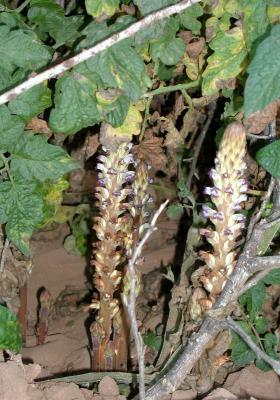 Of all root parasites,Orobanche (broomrape) and Striga (witchweed) see weeds cause most damage to agricultural crops. The broomrape plant is small, from 10-60 cm tall depending on species. It is best recognized by its yellow-to-straw coloured stems completely lacking chlorophyll, bearing yellow, white or blue, snapdragon-like flowers. 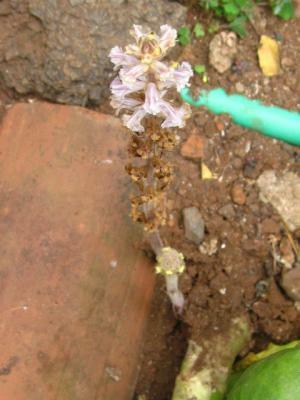 The flower shoots are scaly, with a dense terminal inflorescence (spike) of 10-20 flowers in most species. The leaves are merely triangular scales. The seeds are minute, tan-to-brown, and blacken with age. These plants generally flower when weather conditions are cool to moderately warm. When they are not flowering, no part of these plants is visible above the surface of the soil. As they have no chlorophyll, they are totally dependent on other plants for nutrients. Broomrape seeds remain dormant in the soil, often for many years, until stimulated to germinate by certain compounds produced by living plant roots. Broomrape seedlings put out a root-like growth, which attaches to the roots of nearby hosts. Once attached to a host, the broomrape robs its host of water and nutrients. O. ramosa (branched broomrape or hemp broomrape): Hemp, potato, tobacco and tomato; also on groundnut, cowpea and chilli pepper. O. ramosa was also recorded on aniseed, basil, fennel, and a range of ornamental species. O. crenata (bean broomrape): An important pest of legumes: faba bean, pea, lentil, chickpea, vetch and clover. Also attacks carrot, parsley, celery, cumin, safflower, Carthamus, eggplant, tomato, lettuce, geranium and verbena. O. cernua (Nodding broomrape): Mainly attacking solanaceous crops: tomato, potato, tobacco and eggplant. O. cumana (sunflower broomrape): An important pest of sunflower, also parasitizing safflower. May in certain cases parasitise tomato, when growing in soil previously cropped with sunflower. It is also known to attack caraway (Carum carvi). O. minor (Common broomrape): It attacks red and white clover, lucerne, tobacco, carrot, lettuce, sunflower and many other crops and ornamentals on a local basis. In order to determine the host it is necessary to check which plant's roots are indeed connected to the parasite. There are some erroneous reports based on observations of neighbouring plants rather than of connected hosts. Sometimes the detection of a host is very difficult, especially when a field is used simultaneously for more than one crop, or when the field is loaded with weeds. Vegetative, growing stage and flowering stage. Whole plant, leaves and roots. Root parasites like Orobanche are difficult to control, partly due to their complex life cycle. Orobanche produces numerous dust-like seeds, 0.15-0.5 mm long. A medium-sized O. aegyptiaca plant, for example, can develop 400 flowers or more, each producing about 500 seeds. Thus, a single plant in the field can produce 250,000 seeds (about 184,000 seeds per gram) and a single Orobanche plant is therefore capable of heavily infesting the field, rapidly increasing the seed bank in the soil. The seeds remain viable in soil for over 15 years. When shed, the seeds are dormant and require a period of after-ripening, which is usually completed before the end of the dry season. At the start of the rainy season the seed will absorb water, but it is still unable to germinate. This "conditioning" period lasts for 5 to 21 days at a suitable temperature (15 to 20degC). Conditioned seeds are capable of geminating but a chemical stimulus is needed to trigger Orobanche germination. This stimulus normally comes from host roots. Therefore Orobanche normally germinates only when a host root is nearby. However, a moist environment is required (for several days) together with suitable temperatures in order to render the mature seed responsive to germination stimulants. This preparatory period is known as conditioning or preconditioning. Conditioned seeds remain responsive to germination stimulants for several months. Their ability to respond to germination stimuli fades gradually when the seeds dry and they then remain dormant until re-conditioned. Once the parasite makes contact with the host root, it develops a root-like structure known as haustorium. The haustorium has three functions: attachment, penetration of the host root, and nutrient acquisition from the host. When a successful connection has been made with the host, the parasite can grow rapidly using water and nutrients taken from the host, causing yellowing of leaves, stunting and wilting of the host plant. After emergence the parasite will grow until it flowers, produces seed and dies. The complete cycle takes 10 to 15 weeks. The very small seeds may very easily be moved from one field to another by water, wind, animals and man. The seeds remain viable even after passing through the alimentary system of animals; therefore manure may be contaminated with viableOrobanche seeds. Agricultural products of various crops may carry Orobanche seeds if harvested in an infested field. Agricultural tools should always be cleaned after being used in an infested field to avoid transfer of Orobanche seeds or contaminated soil to non-infested fields. Most of the noxious weedy Orobanche species are native to the Middle East and are adapted to soils of generally high pH. They occur to some extent in wild vegetation but the weedy species are mostly associated with the crops which they attack. O. ramosa, O. aegyptiaca and O. cernua require relatively high temperatures for optimum germination and growth, and occur especially in irrigated crops grown under hot conditions, while O. minor and O. crenata are more temperate in distribution, require lower temperatures for germination, and occur mainly in crops grown during cool conditions or non-irrigated crops. This illustration shows the methods promoted on Infonet-Biovision. The methods shown at the top have a long-term effect, while methods shown at the bottom have a short-term effect. In organic farming systems, methods with a long-term effect are the basis of crop production and should be of preference. On the other hand methods with a short-term effect should be used in emergencies only. On Infonet-Biovision we do not promote synthetic pesticides. Further below you find concrete preventive and curative methods against Broomrape. Phytosanitation is aimed at preventing the spread of viable seeds by minimising the movement of infested soil by farm machinery and vehicles, preventing grazing on infested plant material, treating manure (e.g. composting) and avoiding the use of hay made of Orobanche-infested plants. One should also avoid the use of Orobanche-infested crop seeds. Orobanche flowering stems should be weeded as early as possible. 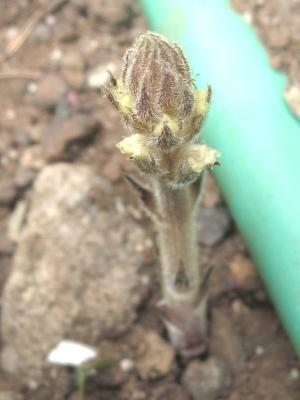 The stems should immediately be discarded and must not remain in the field because they can continue developing flowers and spreading seeds even without being connected to the host. Hand weeding is very important especially when only a few Orobanche plants develop in a field. This can prevent further spread of the parasite and avoid damage. Avoidance of infestation by either delaying the sowing of crops or early sowing, as with sunflower, in reducing infestation and damage by O. cumana. Another way to avoid infestation is to grow non-host crops in the infested field. It is necessary to know the host preferences of the particular Orobanche population in the field, and it should be remembered that Orobanche seeds remain viable in soil for many years, sometimes up to 15-20 years. Both are used to promote extensive germination of Orobanche in soil, in order to deplete the seed reserve. Trap crops promote Orobanche seed germination but do not support parasitism; catch crops support parasitism but are destroyed prior to Orobanche flowering. (b) it takes several years of trap or catch cropping to reduce parasite seed populations to non-damaging levels. Soil solarization, based on mulching soil with transparent polyethylene sheets for several weeks under solar irradiation, kills Orobanche seeds in the upper soil layers. This is effective only where sunshine is sufficient. Breeding resistant genotypes of host plants is one of the most promising approaches to reducing losses due to infestation by Orobanche. Resistant sunflower cultivars were selected in Russia and Spain many years ago, and have been used successfully for decades. However, host-plant resistance was lost in many countries due to selection in the Orobanche populations towards more aggressive biotypes adapted to the newly introduced cultivars. This could also be the cause for the very limited practical success of introducing genetic resistance against Orobanche in other crops, such as faba bean, lentil and tomato. The broomrape-fly Phytomyza orobanchia was widely used for Orobanche control in the Soviet Union and some East European countries. No outstanding success has so far been achieved using this biological agent, mainly because of some hyperparasites (e.g. Opius occulisus) that attack Phytomyza. Orobanche-specific Fusarium oxysporum was used to control the parasite in tobacco and in sunflower. This agent is still to be developed for worldwide biological control of the different Orobanche species. A fungus, Sclerotinia sclerotiorum forma orobanchae, has been recorded in India causing a wet rot of the flowering stem without affecting host plants.